Now that the fall semester has ended, it is really hitting me that I only have one more semester at the Nicholas School. In addition to finishing my class requirements and Master’s Project, there are still local parks and preserves I want to cross off my proverbial list! The NC Birding Trails books are my ultimate guides, and I am faithfully crossing off different locations as I visit them. The Historic Yates Mill County Park has long been at the top of that list, drawing me in with promises of winter waterfowl and interesting boardwalks. The Sunday our semester ended I decided it was the perfect reward for a long fall, and my fiance and I headed out for an afternoon in the sun. 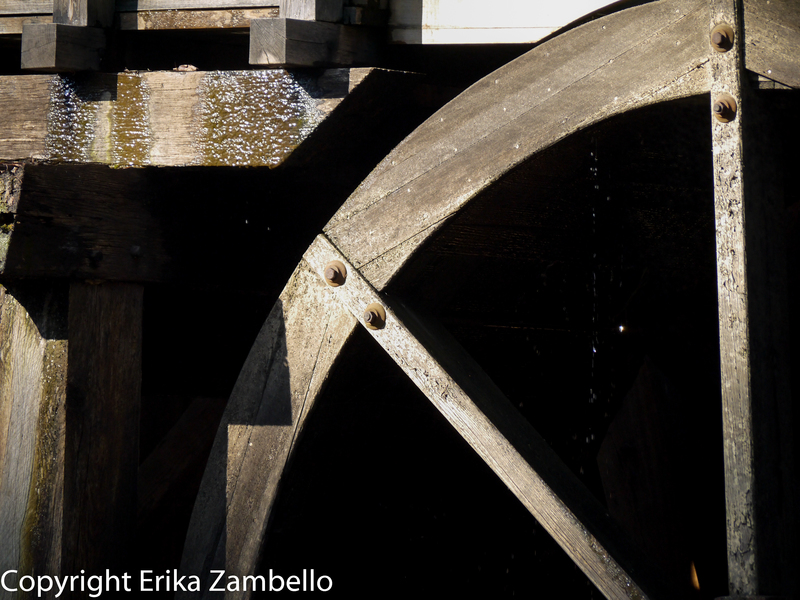 The park covers 174 acres, and includes an environmental center as well as a historic grist mill. 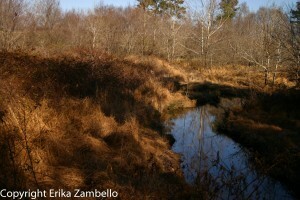 A small dam has created the large pond, fed by a creek surrounded by woods. Though only open to the public since 2006, the park receives 100,000 visitors every year! I was happy to be one of them. We started out on the boardwalk. It was large, crossing an entire section of pond, and wide, with enough space for five or six people to stand side by side. Many locations claim they have a regular population of winter waterfowl, but Yates Mill delivered! 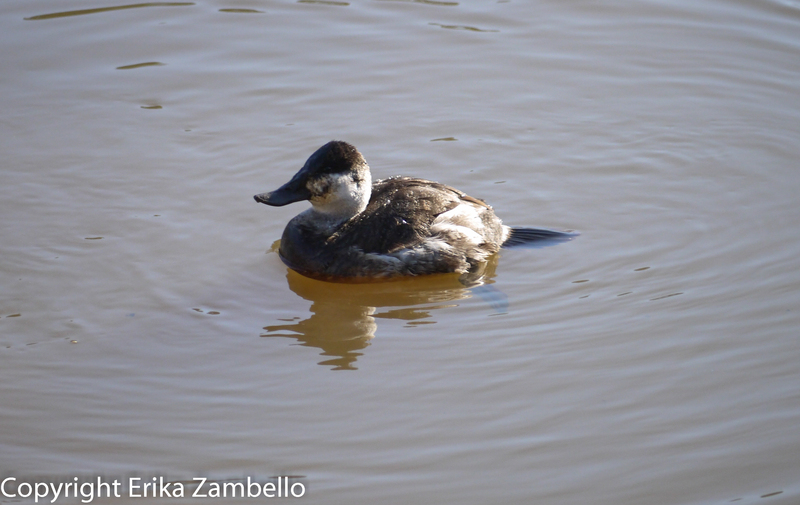 In addition to the usual mallards, the pond was dotted with ruddy ducks, an adorable little species that I had only seen once before, and not yet in 2014. They are smaller than most other ducks, with stiff tails that sometimes stick straight up. When the males are in the breeding season their bills turn a ridiculous aqua blue, a color that is more reminiscent of cartoon characters than ducks in reality. From the pond we followed the paths into the woods, which bordered an agricultural field. The trail provided an amazing example of edge habitat, with eastern bluebirds and crows flitting back and forth between the fields and the canopy, while woodpeckers, chickadees, sparrows, wrens, and nuthatches utilized the trees within the forest itself. The path wraps around the pond, and we ended the tour with a look at the grist mill. 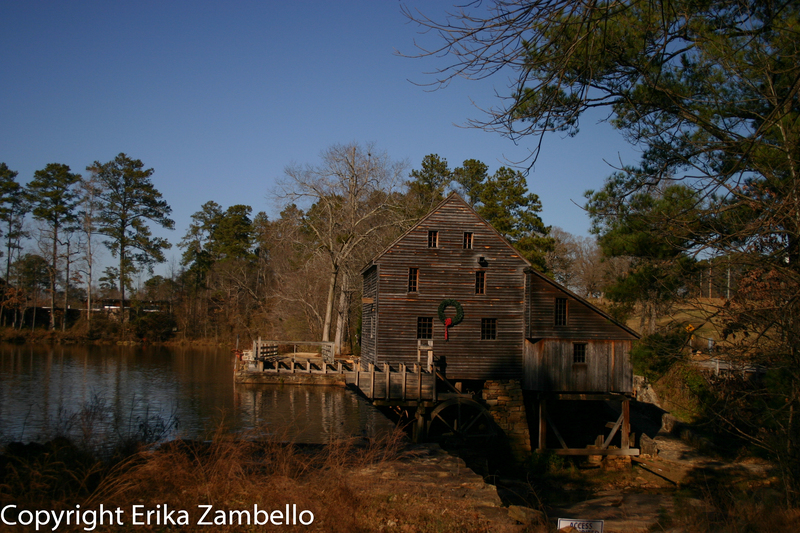 Yates Mill is a product of an extensive local partnership: Wake County manages the visitor center as well as the park, N.C. State owns the property, and a private nonprofit, Yates Mill Associates, maintains and originally restored the mill. Adjacent to the mill is a small barn that was reassembled on the property to mimic the blacksmith shop that once sat on the property. The reconstruction was quite impressive, and the county park offers tours from a trained guide. The site is also popular for photographers, as evidenced by the multitude of family photographs being taken that afternoon. Waterfowl? Check. Beautiful woods? Check. Historical significance? Check. 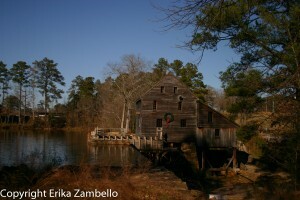 The Historic Yates Mill County Park was well worth a spot on my list of Triangle explorations! 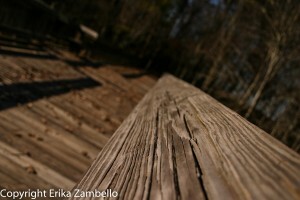 Hi Erika – so glad you made it out and had good weather for your visit! Just wanted to make one small correction: The partnership that keeps the mill and park operating is between Wake County, which manages the park and visitors’ center; N.C. State University (not UNC), which owns the property and does research on-site; and Yates Mill Associates, a private nonprofit (of which I’m the current president) that restored and now maintains the mill building itself. We love visitors – come back again when we resume mill tours in March! Thank you so much for bringing this to my attention! That was a silly mistake on my part, and I will make the correction as soon as possible. Thank you for again pointing that out, it’s rare for me to miss a detail like this and I want make sure I’ve got it right; I’ve gone ahead and made that change. Thank you for coming out to Historic Yates Mill County Park and for your subsequent review and reflections. We’re glad you enjoyed your visit and that the waterfowl delivered (we’ve been seeing a few Pied-billed Grebes, Ring-necked Ducks, Hooded Mergansers and Northern Shovelers as of late, too). Good luck with your last semester at Duke and with wrapping up your Master’s project. Come visit the park again if you get a chance – there’s plenty more to see!